Situated in a peaceful valley at the confluence of two streams, this site would have been sacred to the Romans and is still a very special place today. With the ramparts of the fort guarding the farm yard to the west and the only Roman milestone left standing intact in it’s original position just behind the cottage, few properties in Britain can have so many traces of Rome around them. The cottage at Codley Gate Farm has recently been converted to provide superbly appointed 5 star holiday accommodation. There is a fabulous well-equipped spacious dining kitchen, a cosy sitting room with an inglenook style fireplace and three double bedrooms, each with their own luxury en-suite bathroom. Lovely country walks can be enjoyed directly from the cottage. There is a sheltered graveled yard to sit out in on your return and use of the meadow in front of the cottage. Setting: Codley Gate Cottage was once the main dwelling house on the site but was converted to a milking parlour when our ‘modern’ farmhouse replaced it in the 1800’s. In 2008 the barn was sympathetically restored using the best of modern building methods combined with traditional materials to provide a spacious and comfortable holiday home. The valley is rich in British natural wildlife with red squirrels, deer, badgers and bats regularly seen from the cottage. Swallows, owls and curlews are part of the abundant bird life that surrounds Codley Gate. Area attractions: The list is endless but a few highlights are Vindolanda and the Chesterholme Museum, The Forts along The Wall including Housesteads & Chesters. Kielder Water and Forest park. Country Houses within a short distance include Wallington Hall and Cragside. Coastal Castles at Bamburgh, Dunstanburgh and Lindisfarne Holy Island. The Alnwick Water Gardens and Castle. Whether you wish to visit Roman or other historical sights, enjoy the unspoilt countryside with moorland or woodland walks, visit the Northumbrian Coastline or the Lake District or simply curl up with one of our good books or magazines by the fire, there will always be plenty to do here. The kitchen is well equipped for those who enjoy cooking that special meal, (there are good farm shops, Waitrose and other quality supermarkets to choose from). Alternatively there is a wide choice of places to dine locally. Our family have enjoyed the peaceful tranquillity of Codley Gate for many years and we now look forward to welcoming guests to this special place. We will do everything we can to make your holiday relaxing and enjoyable. Please let us know if there is anything further you need. The cottage is fitted to a high standard to provide the best in comfort and luxury and is decorated in subtle Farrow and Ball colours. There are dimmable halogen lights throughout, a built in sound system to the living areas with an iPod docking station. The kitchen is an impressive room with a high beamed ceiling, slate flooring, extensive painted units with granite work-tops and includes an American style fridge-freezer with water and ice dispenser, Rangemaster Cooker and wall mounted LCD television. There is a drying room for wet weather gear, the high out put combi oil fired boiler provides hot water and central heating throughout the cottage. The cozy sitting room has oak flooring, comfortable Tetrad sofas and an inglenook style fireplace inset with a wood burning stove (fuel provided). There is large flat screen free sat, television. Features include a window seat and a handmade steel and oak banister to the staircase. Well behaved dogs accepted by arrangement. Property is spacious and well appointed,we were only two but it could easily accommodate six without feeling cramped. But still cosy without being too chintzy. Location is great with a lot the major local attractions on the doorstep or a short walk away. We stayed over the Christmas period and the cottage was absolutely perfect. Beautiful Christmas decorations and a lovely welcome in the kitchen with beautiful flowers, wine, freshly made mince pies and selection of cheeses, such a lovely touch to kickstart our break. The cottage is perfect situated in a beautiful stunning valley but not too far from local amenities. The Vindolanda museum and site opposite were wonderful to visit and free entry as guests of the cottage. Colin was most helpful with the booking and with all communications. We stayed with 2 children and elderly mother and we all had a fantastic time. We will be visiting again. The property is a great size and is full of character. It's in a fantastic spot. The only downside was the mould and mildew in all of the bathrooms. This appears to be caused by poor ventilation/ poor fans and lack of thorough cleaning. Lovely cottage, beautiful setting close to lots of wonderful places to visit. Our third time at Codley Gate - thank you to the Galloways! We decided to have a family holiday and chose this cottage as all the bedrooms had an on-suite. We were extremely happy with the cottage and felt really at home, the cottage had everything you would need for a self catering holiday with all equipment and furnishings of a high standard and clean. The welcome pack was a really appreciated. The two dogs and chickens were really friendly, sorry Claire/Neil the dogs did get some scraps. The location of the cottage was perfect for getting out and about, yes even the weather was on our side. The warmth of the whole cottage was exceptional so much so we turned the central heating off after breakfast every day. The woodburing stove was a warm welcome at the end of a day out and gave more than enough heat for the Mid February evenings. Neil came over to ensure everything was satisfactory after our arrival and then left us to it, which was what we liked, for those who like to interact more, Neil and Claire live in a property within the grounds and appear happy to be contacted if needed. We would most definitely stay there again and have no hesitation in recommending the cottage. We recently spent a couple of nights here and thoroughly enjoyed ourselves. The cottage is luxurious and furnished to an incredibly high standard with a traditional and romantic yet modern feel. The kitchen contains everything you could need whilst the living room is comfortable and welcoming. The bedrooms are light and airy, the ensuite bath and shower rooms are a real luxury, and the bed in the upstairs room overlooking the courtyard is the most comfortable I've ever slept in! It's in a charming spot, nestled among green hills with friendly chickens pecking around outside. Fascinating Vindolanda is right on the doorstep and I can definitely see why the Romans chose to live here! You couldn't ask for a better place for relaxing peace and quiet or for beautiful views. Alice and Robin from Cornwall. Codley Gate Cottage is situated in a former farm yard amongst a cluster of old traditional farm buildings and the Farmhouse. It is approached via a quiet access lane (the old Stanegate Roman road) and is immediately adjacent to the World Heritage Site of Vindolanda and the Chesterholme Museum. Codley Gate is set partially in the Northumberland National Park and is just under one mile below, what is considered to be, the most dramatic section of Hadrian's Wall. The village of Bardon Mill just over a mile down the valley. 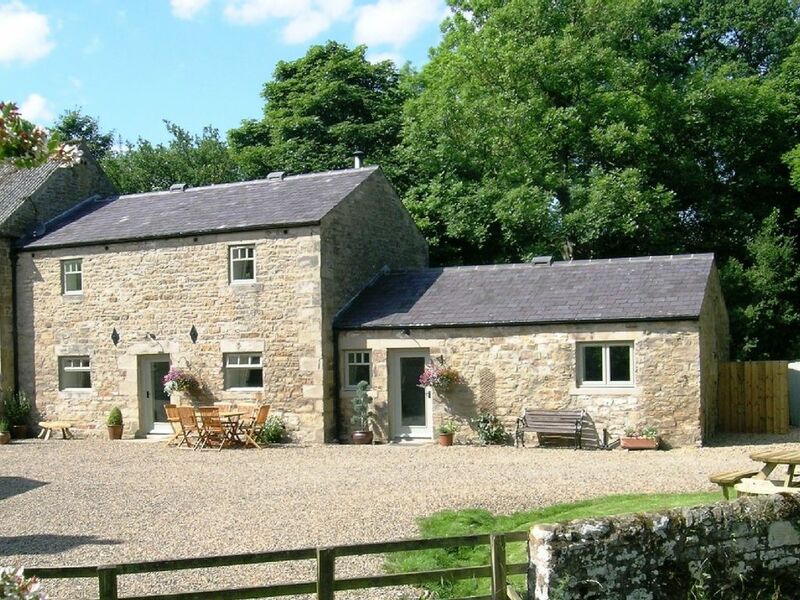 The nearest town is Haltwhistle, 4 miles to the west and the award winning market town of Hexham is 14 miles east. The city of Newcastle Upon Tyne with it's lively Quayside and Baltic Art Centre is 35 miles to the east, whilst historic Carlisle 'Gateway to the Lakes' is 24 miles to the west. To book or enquire about the cottage please either email us as shown or telephone 01434 344 277 Deposits are 1/3 of the total price with the balance due 5 weeks before you arrive. Last minute bookings are payable in full 7 days before by cheque or on arrival in cash. All prices quoted are per week and should be checked on booking. Short breaks may be available in low seasons.